WASHINGTON -- Republican Texas Attorney General Ken Paxton moved to muzzle a former state regulator who says he was ordered in 2010 to drop a fraud investigation into Trump University for political reasons. The former state regulator told The Associated Press on Friday that decision was highly unusual and left the bilked students on their own to attempt to recover their tuition money from the celebrity businessman. Trump University is the target of two lawsuits in San Diego and one in New York that accuse the business of fleecing students with unfulfilled promises to teach secrets of success in real estate. A federal judge overseeing one of the class action suits unsealed documents in the case earlier this week, then ordered some of those records to be withdrawn from public view, saying they had "mistakenly" been released. Trump has personally attacked U.S. District Judge Gonzalo P. Curiel as "a hater of Donald Trump," claiming he is biased against Trump because of his Hispanic heritage. "We're in front of a very hostile judge," Trump told a crowd in San Diego on May 27. "The judge was appointed by Barack Obama, federal judge. Frankly, he should recuse himself because he's given us ruling after ruling after ruling, negative, negative, negative." 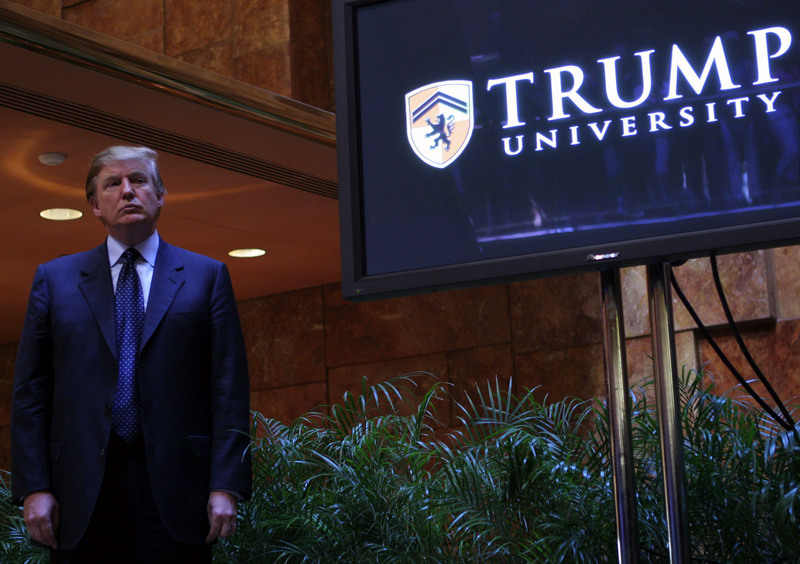 Despite the lawsuits, the presumptive GOP nominee said Thursday he plans to reopen Trump University once the legal cases are resolved. As CBS News reported in September, Trump University closed not because of litigation, but because students were not signing up for its Gold elite mentoring program that cost $35,000. The university, as a result, could no longer afford to fulfill its commitments to the students who had already paid. A June 2010 memo from Trump University said the program was facing "significant operations risk" and it closed a month later. A former employee told CBS News that the program was "run into the ground." According to the documents provided by Owens, his team sought to sue Trump, his company and several business associates to help recover more than $2.6 million students spent on seminars and materials, plus another $2.8 million in penalties and fees. Owens said he was so surprised at the order to stand down he made a copy of the case file and took it home. "It had to be political in my mind because Donald Trump was treated differently than any other similarly situated scam artist in the 16 years I was at the consumer protection office," said Owens, who lives in Houston. Owens' boss at the time was then-Attorney General Greg Abbott, who is now the state's GOP governor. The Associated Press first reported Thursday that Trump gave donations totaling $35,000 to Abbott's gubernatorial campaign three years after his office closed the Trump U case. Several Texas media outlets then reported Owens' accusation that the probe was dropped for political reasons. Abbott spokesman Matt Hirsch said Friday that the governor had played no role in ending the case against Trump, a decision he said was made farther down the chain of command. "The Texas Attorney General's office investigated Trump U, and its demands were met - Trump U was forced out of Texas and consumers were protected," Hirsch said. "It's absurd to suggest any connection between a case that has been closed and a donation to Governor Abbott three years later." Paxton issued a media release about the cease and desist later Friday, saying Owens had divulged "confidential and privileged information." Owens first learned about the state's action against him on Friday afternoon when contacted by the AP for response. "I have done nothing illegal or unethical," said Owens, a lawyer. "I think the information I provided to the press was important and needed to be shared with the public." Donald Trump calls judge in Trump University suit "a hater"
Paxton faces his own legal trouble. He was indicted last year on three felony fraud charges alleging that he persuaded people to invest in a North Texas tech startup while failing to disclose that he hadn't invested himself but was being paid by the company in stock. Paxton has remained in office while appealing the charges. Texas was not the only GOP-led state to shy away from suing Trump. Florida Attorney General Pam Bondi briefly considered joining a multi-state suit against Trump U. Three days after Bondi's spokeswoman was quoted in local media reports as saying her office was investigating, Trump's family foundation made a $25,000 contribution to a political fundraising committee supporting Bondi's re-election campaign. Bondi, a Republican, soon dropped her investigation, citing insufficient grounds to proceed. In New York, meanwhile, Democratic Attorney General Eric Schneiderman sued Trump over what he called a "straight-up fraud." That case, along with several class-action lawsuits filed by former Trump students, is still ongoing.